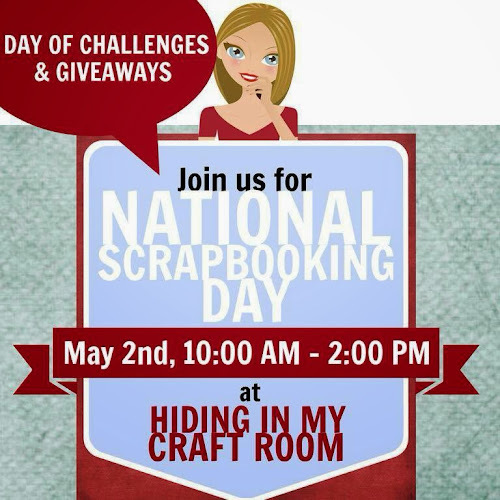 Hiding in My Craft Room: National Scrapbooking Day Celebration!!! If you are here for our weekly challenge then you're a wee bit early today as today is National Scrapbooking Day!! And we are going to have a special day of challenges and giveaways!!! And of course, a whole lot of crafty fun!!! So please visit back on 10AM Central time! That's when the fun will begin!! We will be having challenges with giveaways every hour on the hour from 10AM - 2PM today with a couple of special 'comment only' giveaways sprinkled within our National Scrapbooking Day fun!!! And as always our challenges will be open all week! So if you don't get a chance today to get crafty, you can still participate in the FUN!!! See you at 10AM! Sounds like fun. See you later. Sounds like a fun time! Count me in!